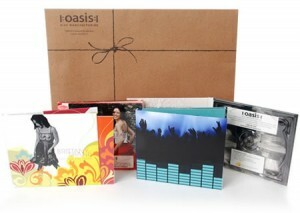 Get Free Oasis Eco-Packaging Kit Sample. Simply fill out the form to get your FREE sample. The Oasis Zero Carbon Footprint Digipak™ (using 88% less carbon than a traditional package, and offsetting the rest, including the CD for a 100% carbon neutral result); The No Corners Cut™ Wallet; The Oasis Soft-Spot® hub package; and more. PLEASE NOTE: Samples in your kit do not include CDs.